If you are planning to visit Salzburg, the chances are you will fly into Salzburg International Airport. This page is designed to answer the many questions you may have about Salzburg Airport, Salzburg itself, getting to and from the airport, the attractions in Salzburg, ski areas close to Salzburg airport and much more. Salzburg Airport W.A. Mozart (SZG airport )in Austria is the gateway to many of Austria’s most famous sights and attractions. The stunning city and old town (which is a UNESCO World Heritage site), is not only famous for being the birth place and home to one of the world’s most well-known composers ‘Wolfgang Amadeus Mozart’ and the location for the iconic film ‘The Sound Of Music’ but it also offers a unique charm with an amazing backdrop of natural rugged mountains. The city of Salzburg is a fantastic city to visit regardless what month it may be. Whether you visit Salzburg in the Summer months, when the flowers are in full bloom or Winter when the mountains are capped with snow, the city will not fail to impress. Salzburg Airport is certainly a gateway to many of the wonderful gems Austria has to offer and if you are planning on flying to Salzburg Airport and would like an insight into the airport and facilities, hopefully this page will help. Salzburg Airport has two Terminals, Terminals 1 & 2. 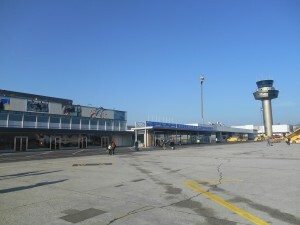 Terminal 2 is the smallest of the two terminals and is located at the end of the airport building and is generally used by the low cost airlines such as Ryanair, Easyjet and Jet2. This depends on what transport option you choose to take from the airport. The local bus between Salzburg airport and the centre of Salzburg, take approximately 20-25 minutes depending on traffic. No, there is no direct rail link from Salzburg. If you are wishing to take the train to your final destination, you will need to make your way to the main train station in Salzburg. Yes, there are several bus services that provide a cost effective form of transfer to and from the airport. There are several hotels that are close to Salzburg International Airport but the closest hotel to the airport is aptly named the ‘Airport Hotel Salzburg’, which is actually located opposite the airport terminals and is just a 10o yards walk from Terminal 2. Simply exit the airport terminal and the airport hotel Salzburg is located to your left at the far end of the car park. 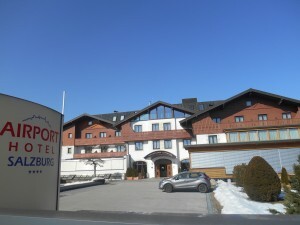 this hotel is perfect for passengers arriving at Salzburg Airport on a late night flight or departing from the airport on an early morning flight. The ‘Hotel Salzburg’ is located just a few minutes walk outside of the airport grounds and ‘The Star Inn Hotel’ is approximately a 15-20 minute walk from the airport. If you wish to leave any bags or luggage at the airport, you can do so by leaving them at the ‘Baggage Storage’. There is a charge for leaving your baggage at it is charge at a set fee per every 24 hours. As with most International Airports, passengers are required to check for their flights before they are allowed to board the aircraft. Passengers can check-in at the airport or online (if the airlines offer that facility). Passengers wishing to check-in at the airport should make their way to the Departures area and are advised to arrive at the airport at least 2 hours prior to their departure time. Yes, there is a Duty Free shop at the airport which is ‘Heinemann Duty Free’. Being one of the main airports in Austria, Salzburg International Airport provides a very efficient transport network, that provide transfers for passenger to and from the airport to the city centre of Salzburg and also to many other towns and ski resorts close to Salzburg Airport. Passengers arriving and departing from the airport have a number of transfer options in terms of transport and can choose from car hire, public buses, shuttle buses or taxis. One of the quickest ways to reach your destination from the airport is by taxi but obviously, this is the most expensive form of transfer, especially if you are travelling alone. A really popular choice with many passengers is pre booking a taxi in advance, as it provide you with peace of mind and allows you to pay for your taxi in advance. This means you will not have to worry about being over charged for your taxi from Salzburg airport to your final destination. There are several public bus services that run from the airport to the city centre of Salzburg. The number 2 and number 10 buses both go to Salzburg but the number 2 bus stops at the train station (Hauptbahnhof) in Salzburg whilst the number 10 stops at the centre (Zentrum). The public buses to and from Salzburg Airport are certainly a very viable option and cost 2 euros (at the time of writing) fro a single 1 hour travel ticket. You can purchase your ticket from one of the machines at the airport or you can purchase a ticket from the driver on the bus. If you purchase your ticket from the machine before you get on the bus, the ticket will cost 2 euros, if you purchase the ticket from the driver on the bus, your ticket will cost 2.60 euros. If you buy your ticket from the macjine, you will need to validate your ticket once you get on the bus by simply inserting your ticket into the red machine on the bus. This will then stamp your ticket with a time and you have 1 hour travel time once your ticket is validated. There is no direct rail link to the airport, so if you wish to travel by train to your final destination, you will need to get to the main central train station in Salzburg. As previously mentioned, you can catch the number 2 bus from the airport to the main train station (Hauptbahnhof) in Salzburg and from there, you can trains to a wide number of destinations. Car hire is a very popular option with passengers arriving at Salzburg International Airport, especially in the Winetr months when the airport has a large number of passengers wishing to get to the many different ski resorts close to Salzburg Airport. Car hire from the airport is a very viable option, especially if there are several people travelling in your party, where the cost can be shared. Car rental from Salzburg Airport (SZG) is generally quite cheap and the prices between car hire companies are normally pretty competitive. However, it is always advisable to compare price to ensure you receive the best price for car hire for the dates you require. There are several companies that offer shuttle services from the airport, especially to the any ski resorts around the Salzburg area. In Winter, Salzburg Airport provides the perfect gateway to the Austrian Alps and with some of the best ski resorts in Austria close at hand, it is not hard to see why so many people and airlines now fly to Salzburg. The new Business Lounge at Salzburg Airport now offers passenger complimentary WiFi, a business centre, a bathroom, snacks, pastries (in the morning), sandwiches and desserts (after 11am), tea, coffee, soft drinks, alcoholic drinks and a variety of magazines and newspapers. Opening Times: 5am – 9pm Monday – Friday and 5am – 7pm on Saturday.